Fees associated with filing trademark applications in Russia, as well as other trademark fees, are available in the fee calculator. A trademark application in Russia may be filed in respect of several classes of the international classification. Legalisation or notarization is not required. Filing a POA is not an obligatory requirement unless it is requested by the Patent Office in the process of the application registration. There is no official opposition period stipulated by the Russian IP legislation. The non-official opposition may be filed during the whole term of examination before issuance of the decision to grant a certificate on a trademark in Russia. The official fee for trademark registration in Russia must be paid within two months from issuance of the decision to register a trademark. This term may be restored within six months. A trademark in Russia is valid for ten years from the date of filing the application and may be renewed at the owner's request for 10-year periods an unlimited number of times. A request for trademark renewal should be filed during the last year of the current 10-year trademark validity term. This term may be extended by a six-month grace period on condition of payment of an extra fee. Reinstatement of a lapsed trademark after grace period expiry is not possible. Continuous non-use of a trademark in Russia within any three years after its official registration may cause the cancellation of the trademark provided that an interested person has filed a motivated request to the Court. It is required for the foreigners to perform the trademark prosecution in Russia through an agent, a registered Russian trademark attorney. Verbal, figurative, three-dimensional and other elements or a combination thereof may be registered as a trademark in Russia. 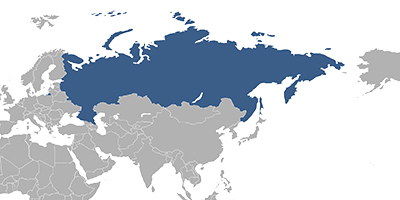 Online Search Databases: Russian Trademarks, International Trademarks.